The Mark Hall Band performs Country & Classic Rock. We have been entertaining venues and corporate shows now for the past few years . Each show is put together for the peoples dancing pleasure . Mark Hall Band aims to please and keep the dance floor going with up tempo music from the 80s Country/Classic Rock to the top 40 hits . It is in our interest to have fun as well as making sure everyone is having fun and enjoying the evening . Mark and the guys like to mingle making the audience part of the show and to create a connection to the people . Mark Hall Band members are very professional with years of exp behind them . The guys love for entertaining a crowd is 100% from the start of the evening through to the end of the evening . 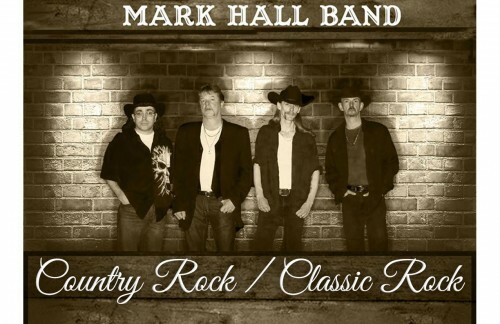 Mark Hall Band has worked in venues as well as casino's and corporate shows . About the guys in the band! Mark has been playing guitar, drums and bass for well over 20 years. He took up playing guitar at a young age. Influences were his Dad, Chet Atkins, Waylon Jennings to name a few. Mark has played with a wide range of musicians from Rock, to Country. He has played with Ronnie Hawkins, Tami J, Wilde , Lonestar Oasis, End of Silence and Thunder Brothers. He now fronts his own band. Gary is originally from BC has played for Larry Evans, Blackwater, Ronnie T Reed, The Platters, Coasters, Buddy Knox as well as various Legends of Rock n Roll. Has been playing for over 20 years. Rick "Lonewolf" Maillet- Bass & Vocals- hails from Toronto On. He has been playing guitar for over 20 years. He played for Tombstone Dream & Mental Ward before coming to Alberta in 1997. He than played for Dark Knights, Next Exit, co-formed the band Wild and Shuffled, and Vercitile, After a call Rick stepped in as a bass player for Mark Hall Band, taking his hard rock guitar styling and applying it to a genre and instrument outside of his regulars resume. Lloyd is from Newfoundland and also comes to us with 20 + years of experience. He played all over Nfdlnd before coming to Alberta in 1991, where he played for Midnight Train, Rudes Crew, Driving While Blind & Road Apples. Lloyd has done a lot of fill in work with a wide range of bands in the Lethbridge Area.